Community-Supported Agriculture looks different in every town, but for the most part, they work like this: You pay a subscription fee up front to a local farm. Then for a certain number of weeks, the farm gives you a box of produce, containing whatever was harvested that week. Each week the box looks a little different, though it’s fairly easy to guess what types of foods you’re going to receive if you know a little about seasonal produce in your area. (Hint: spring means greens. Lots of ’em.) Most CSAs use organic and sustainable farming techniques. Read more at LocalHarvest.org about the benefits of CSAs for both farmer and consumer. Where is your CSA subscription? Our subscription is with the Community Nutrition Partnership, a nonprofit in North Carolina that aims to provide fresh, healthy produce to families of all income levels. Unlike a traditional CSA with a local farm, going through a nonprofit means that our subscription also pays for TWO needy families to have their own subscription. Also, if people forget to pick up their CSA one week, instead of going back to the farm to rot, that box will be delivered to a local family in need. Also, they deliver. Awesome perk. How can I find a CSA for me? Check out the interactive map at LocalHarvest.org to find a CSA in your area. What’s in my CSA box this week? Pasta! We sauteed some of the collards and 2 tomatoes in rosemary and olive oil. We added spaghetti noodles and jarred tomato sauce to complete the pasta, and served it with hunks of baguette and a couple eggplant cutlets from Trader Joe’s on the side. Breakfast smoothie! I added two kale leaves to my fruit smoothie. And since it was Valentine’s Day, I added 3 or 4 beet leaves to make it pink. With bananas, vanilla yogurt, and orange juice, it was delicious (just tastes like fruit) and healthy. I sauteed some more collards, this time in garlic grapeseed oil. I took them to work and mixed them into some leftover Indian chickpea soup with that I got from Sandwhich. Served over white rice that I pre-cooked, my leftover soup became a delicious curry dish. For Valentine’s Day, the BF and I decided to play it chill and spend some time together at home. I made a cabbage and carrot slaw (shredded cabbage, matchstick carrots, juice of 1 clementine, a bit of garlic grapeseed oil, salt, and pepper) that we enjoyed as a healthy side dish to the Papa John’s pizza we ordered. Then we settled in for a marathon of The Wire — we’re halfway through season 1! Apple and peanut butter for breakfast. Some more cabbage and carrot slaw with leftover pizza. Delicious kale and bean soup with a hunk of baguette. A green smoothie! Kale, orange-peach-mango juice, banana, frozen pineapple, and blueberry yogurt. Yum! A green smoothie before hitting the road to Asheville, NC! Bowl of leftover kale and bean soup for a late dinner. Green smoothie! Not even getting tired of these. 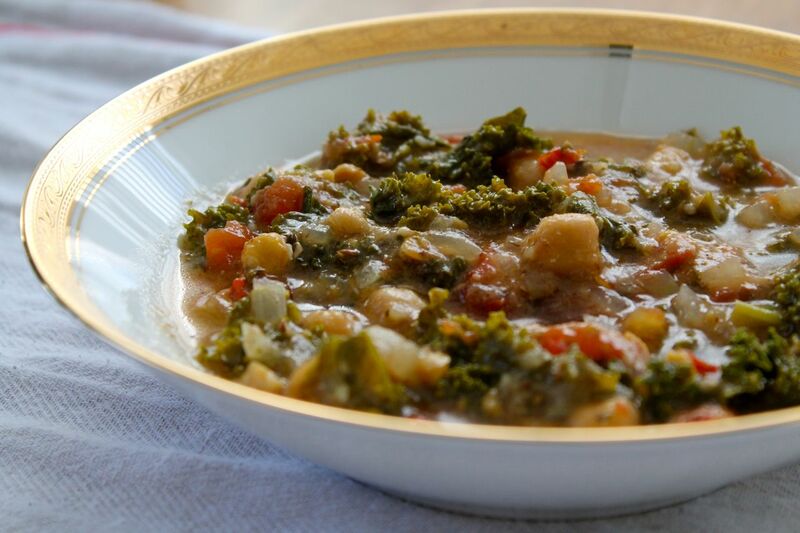 Bowl of leftover kale and bean soup for dinner. Plus I made a salad with greens, beets, walnuts, and fried goat cheese. The goat cheese was the best part (duh). Apple with peanut butter for breakfast. I didn’t have time to put anything together, so I just had leftover beets for lunch, added to a random hodgepodge of snacks to make a meal. I had 3 collard green leaves leftover that I’ll just throw out — they’re pretty limp.